The less heralded, but arguably more efficient Duke big man this past season, Wendell Carter Jr. sports a 7’4.5″ wingspan and fills up nearly every box score statistic. The versatile Center out of Atlanta ranked #7 in RSCI coming out of high school. Despite that ranking, Carter played second fiddle to Marvin Bagley III to start the season, but as the season went on, Carter started to establish himself as the more diverse player. At the end of the day, one can slice and dice data infinitely many ways and can often times slice it in a way that tells a story one wants, but the point here is that Carter showed significant contribution across all major statistical categories in a way that few freshmen bigs have. The first player that comes to mind when comparing the slow-footed but diverse big man is Al Horford. Although, when observing Wendell Carter Jr’s top scored similar players by our Similarity Scoring metric, we find the likes of Noah Vonleh, Andrew Bogut, Kevin Love, and Karl-Anthony Towns to name a few. A collection of bigs with offensive diversity, rebounding, and varying defensive ability, while having different levels of success in the NBA. Nevertheless, we have further supported Carter’s playing style as a modern NBA center that few have successfully mastered. ***One reason that the Al Horford pairing likely fails to show up in our scoring system is the change in College Basketball. Al Horford attempted four threes in three seasons at Florida. If Horford’s college career occurred during the small ball era, I would imagine we would’ve seen a significantly larger number of three point attempts from the NBA All Star. Carter grades out as the 4th highest player amongst 2018 NBA Draft prospects by PNSP with a score of 90.0. Remember, PNSP ranges from 0-100 with a roughly normal distribution, meaning Carter’s 90.0 rating is very good. Because PNSP is a scaled aggregate of box score statistics, we can determine how prospects, specifically Carter in this case, project in different statistical categories. Interestingly, but unsurprisingly, Carter gets to his 90.0 by projecting above average in most statistical categories with no elite projections in any one category at the center position. Our NBA Role Probability Model gives Carter a 97% chance of making the NBA in some form. His most likely outcome is as a starter or sixth man in the NBA. These results appear to be inline with public consensus. While Carter’s Starter likelihood is roughly 50%, he still is given a 30% probability of being an All-Star. We saw statistical groupings that put Carter in the Towns, Embiid, and Davis breath, but the NBA Role probability model does not predict quite the same level of talent in Carter as the aforementioned All-Star big men. Is Carter the next Horford? 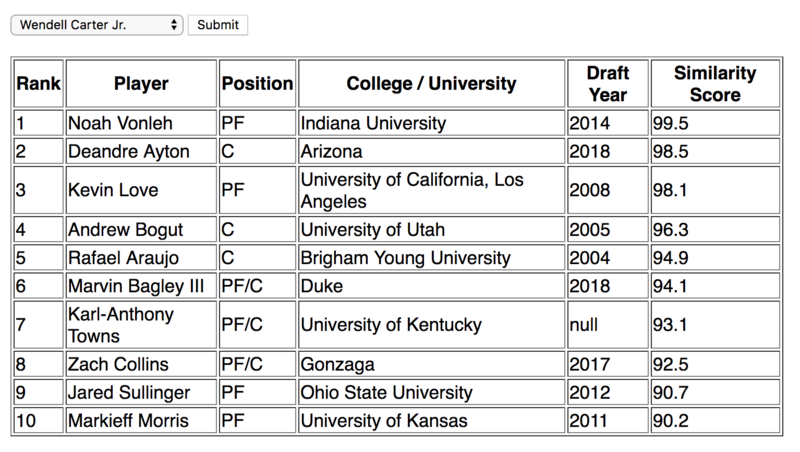 His one-year of college statistics certainly point in that direction; a modern NBA center that can contribute in many ways driven primarily by good awareness and high Basketball IQ. Based on his physical measurements and statistical production, Carter appears to be among the safest bets to make it in the NBA. Despite his high projection, there is still legitimate question about the positional value of a Center at Carter’s size, and whether or not that type of player will even see the floor at all in the NBA 5 years from now. Nevertheless, if Carter can prove to stay in front of perimeter players well enough, its difficult to envision many outcomes where Carter isn’t a viable NBA contributor.